Each year when Apple releases a major iPhone update many people lose data during the upgrade. Apple officially released iOS 10 to consumers today. Let's make sure you’ve backed up your iPhone or iPad in case you experience any troubles when installing iOS 10 on your device. While all data stored on your iPhone is important, we hear the most frustration from iPhone users whose text message and iMessage history gets deleted after upgrading their device to the latest iOS. It today’s world, text messaging is used not only for quick routine personal communications, but also for business, legal, and important family related communications. For this reason, before you upgrade to iOS 10, we recommend taking several steps to ensure you have backed up your device and that your iPhone text message history is safe and sound should you ever need to recover messages that become missing or deleted after a major iPhone update. Step 1. 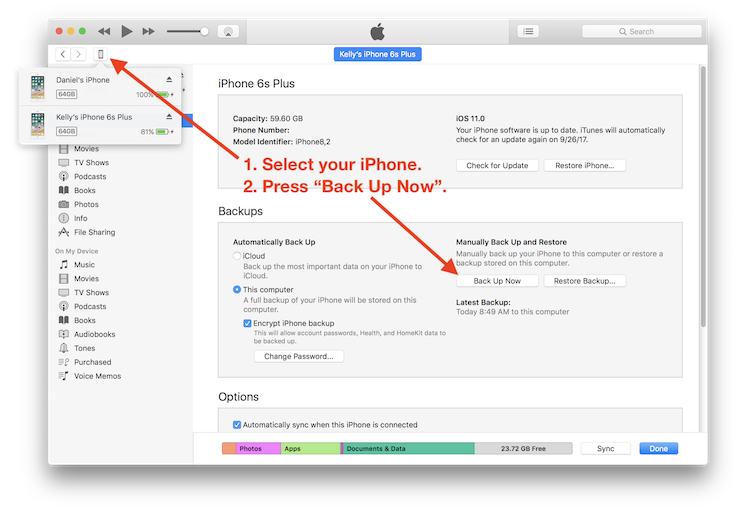 Make a local (not iCloud) backup of your iPhone. To do this simply plug in your iPhone into your computer and select your device in iTunes. Then press "Back Up Now." Making a local iTunes backup of your iPhone or iPad is quick, easy, and ensures you have a copy of your iPhone data locally on your computer that you control. Also, you don’t have to worry about iCloud’s limit of 5 gigabytes of free storage. Step 2. Save or transfer your iPhone text messages to computer. If upgrading to iOS 10 causes data loss, you will sleep peacefully at night if you already have a secondary copy of your text message history exported and saved on your computer. 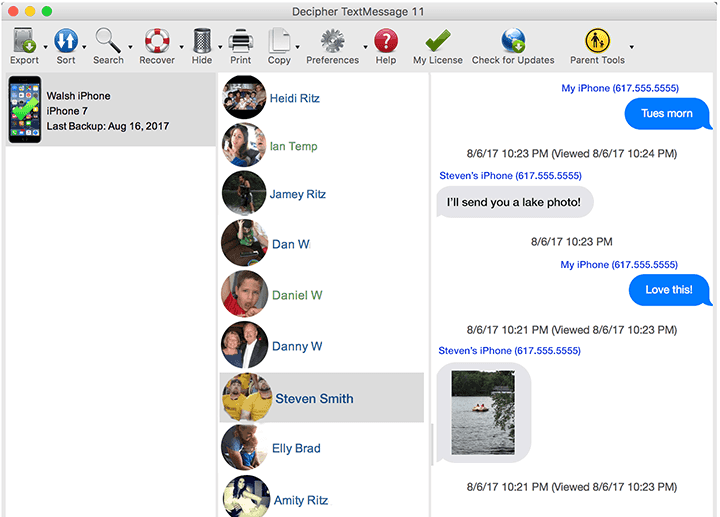 Decipher TextMessage will let you transfer and save all your iMessages and text messages to Windows or Mac. From there you can keep your text messages archived and also print or PDF the message history if needed. Step 3. Download the free trial of Decipher TextMessage and you can instantly get a feel for how easy it is to save iPhone text messages to computer for safekeeping. The software will recognize your device and you can quickly select a contact and read your iPhone text message on your Windows or Mac computer. Once the text messages have been read into Decipher TextMessage, you immediately have a separate history stored and saved of all your text messages and iMessages. You can also then export all or individual text messages to your computer for further safe keeping. Taking a few simple steps before you upgrade your iPhone this year to iOS 10 can save you headaches and hassles down the road. Be pro-active and make sure you’ve transferred your text messages to computer before you download and install Apple’s latest and greatest iOS 10 update. This will ensure that you have a safety copy of all your text message communications should you ever need to access them. Have any questions about saving text messages and iOS 10? Simply drop us a note via our support email and we’ll be happy to reply. We’re based in San Francisco and Phoenix and we respond to everyone. ;-) You can also read some of our happy customer testimonials here. How can I get the special effects like The balloons rising and the fireworks etc. How can I get the the special effects on my text meggases , sure the balloons riding, fireworks etc .???? !